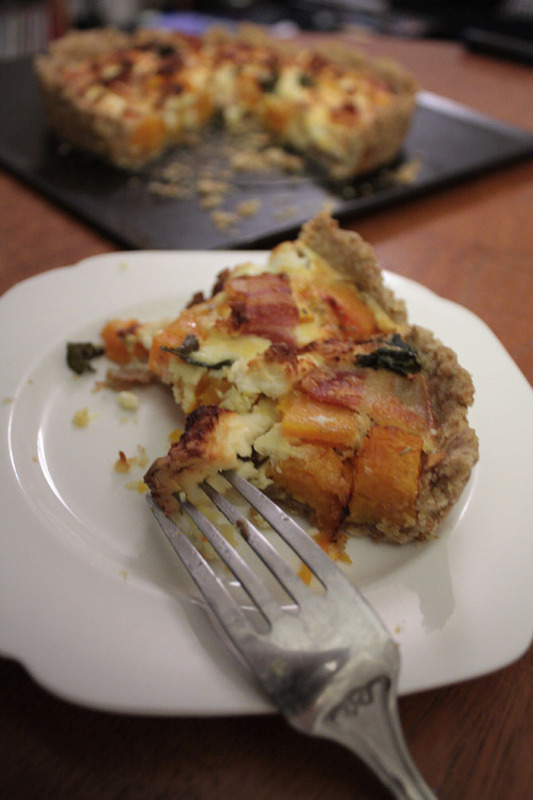 I came up with this quiche one night, when I was craving bacon and sweet butternut squash. Yum! Make the dough: cut the cold butter into little cubes and mix with the egg and flours, salt. Mix it with a handmixer until it resembles breadcrumbs. Then, start kneading it fairly quickly so it doesn’t get warm. You will need to add a bit of water since the dough is really crumbly. Once you get a ball out of it, wrap it in cling film and refrigerate for about 1 hour. Over to the butternut squash. Peel it, deseed it and dice it. Put the dice into a roasting tin, splash some olive oil, salt and the rosemary on it. Bake in the oven until it is fairly soft but still with a crunch to it (about 15-20 mins). Meanwhile, chop the onions and fry in olive oil until transluscent. Make the flan: in a bowl mix the 2 eggs, the cream and parmesan, season with salt and pepper and add a bit of water or white wine to make it a bit less dense. Not much, about half a little glass. Now it’s time to take the dough out of the fridge and roll it out. Mine was still fairly crumbly (but I used about 300g of wholemeal flour since I had run out of normal flour, so it shouldn’t be too bad for you). Flour your surface and roll out, and transfer into your quiche base (which you have greased before if your tin needs it, mine didn’t since it’s non-stick). Don’t worry if the dough breaks or doesn’t fit exactly. Nothing you can’t amend with another little piece of dough that you mold to fit. Think of it as play-do! Now sprinkle your onions over the base. 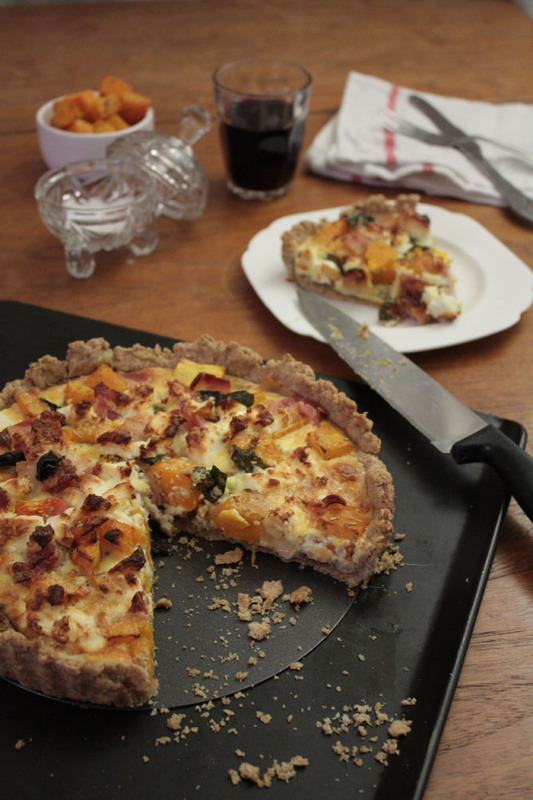 Top with butternut squash, bacon and crumble the feta over it all. Then, pour the flan mix over it all. Bake for about 45 mins in the oven and serve with a fresh green salad. Quiche! Great for weekend lunch! – I regret not making it around to your place. 🙂 Hope you and Elmira had a great time! And then i see the quiche! I wanted to say “how can you do this to me” but i won’t! The weekend i had with you was perfect, delicious and sooo lovely! You just amaze me, i love you! P.s. You could freeze a bit of quiche for me?! This looks phenomenal! I have a girls brunch once a month and i think this would be awesome for it! @ Lawrence: when can you come over so I can cook for you again?! @ Delishhh: Butternut Squash is fantastic, and it’s still just about in season, so go for it! 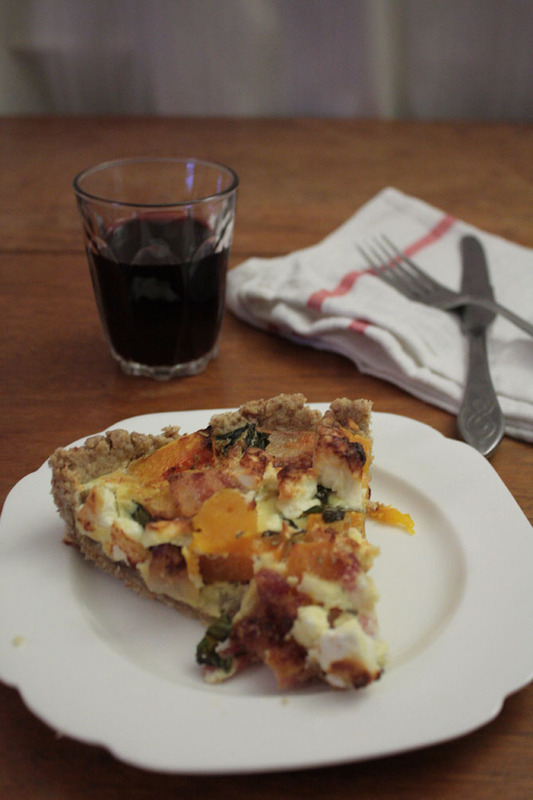 Your quiche looks amazing too! This one’s a bit more dry, best to serve it with a nice fresh salad! @ Jessica: Ah girls brunch is a great thing! We’re hosting one in our flat this coming Saturday and I need to start planning! Your Berry Meyer Lemon Pancakes are very, very tempting! I bet this quiche tastes yummy! Hi anne, am loving your web site. I own a kitchen studio in Kent. You would be more than welcome to use it for photoshoots or demonstrations. Wow, we made this for dinner this week and it was amazing! Thanks for the great recipe!